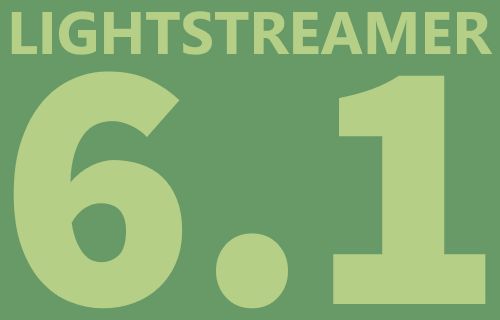 We are very excited to announce general availability of Lightstreamer Server 6.1, which includes many new features and improvements. Lightstreamer now speaks a brand new protocol, called TLCP. The Android and Java SE client libraries use the new protocol and natively support WebSockets. The iOS client library has become more Swift-friendly. A new client library is available for Microsoft .NET PCL, replacing older .NET, Windows Phone, and WinRT libs. In addition, several fixes and optimizations have been added to most components. It's super easy to check out Lightstreamer 6.1. You can either download the installation package, or run the official Docker image, or launch the official AWS AMI.